Distinguished by its wood cladding, blue Board and Batten shutters, and welcoming verandas, this classic yet informal beach retreat combines contemporary architectural influences with historic New England born aesthetic. 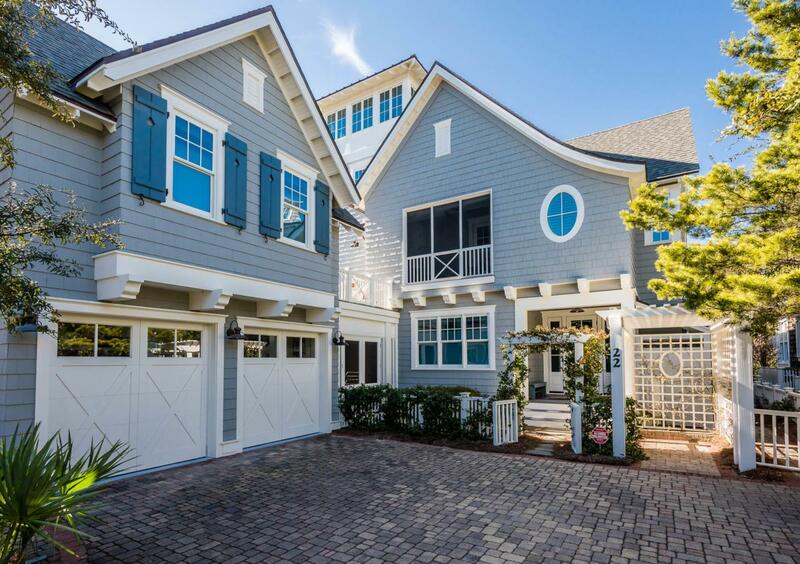 Wooden pathways transport you through the picturesque community nestled among the rolling dunes of WaterSound Beach. The home's arbor adorned with flowering vines welcomes you to this 4,257 square foot estate which features a fun and functional reverse floor plan. The spacious 4 bedroom main house with a bonus bunk room offers an appointed carriage house and can be found in the heart of the private community. 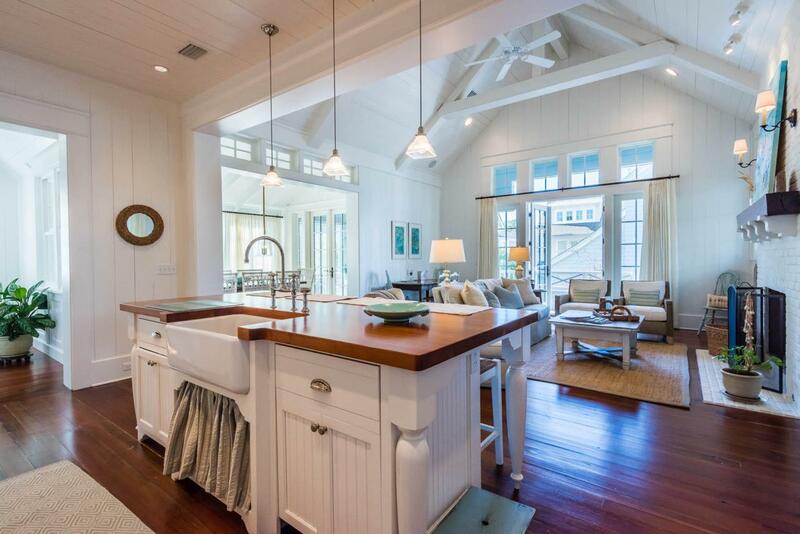 Soaring ceilings, wood floors and natural light abound, this home donned in ornate wainscoting and simple shiplap paneling creates a coveted andcomfortable beach cottage escape for your family. The main floor living room features shiplap ceilings with beautiful beams running crosswise, and vertical wood paneled walls to accentuate the elevated interior. Two expansive guest suites and a double room with a detached bath can also be found on the main level of this home, as well as, a bonus bunk room for four with built in storage space. The heart of the home can be found on the second level, which features an open concept great room, a spacious coastal kitchen, and a dining room; which encompasses a dividing wall of picture windows that flood the space with natural light and adds a charming detail to the room. The open kitchen offers crisp white cabinets,carrara marble countertops, a center island and breakfast bar, apron sink, a 1950's vintage Northstar fridge, and a classic 1940's antique Wedgewood stove. The home's great room offers vaulted wood paneled ceilings with exposed beams, transom lights and access to a covered porch. Off of the expansive dining room with seating for eight, you can enjoy alfresco dining year round in the screened-in eating porch. Also on this level is a spacious master suite with an attached master bath, expansive walk-in closet and a private screened-in porch. Enjoy the added convenience of the home's elevator and attached two-car garage. 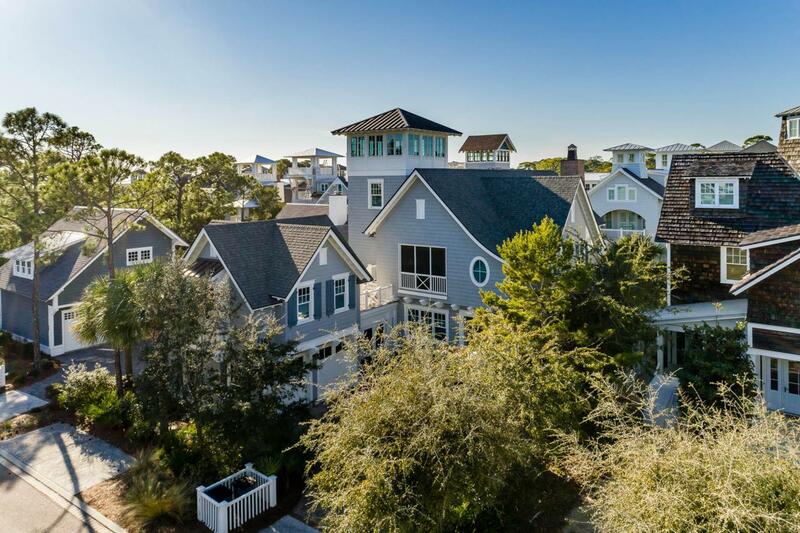 The top floor of this home offers an expansive crow's nest featuring panoramic views of WaterSound and the emerald green hues of the Gulf of Mexico. The home offers a screened in front porch flanking the front door, a convenient landing pad connecting the main house and carriage house, laundry rooms on both levels of the home, a screened in patio connecting the main house and garage, and multiple window benches meant for enjoying a good book. 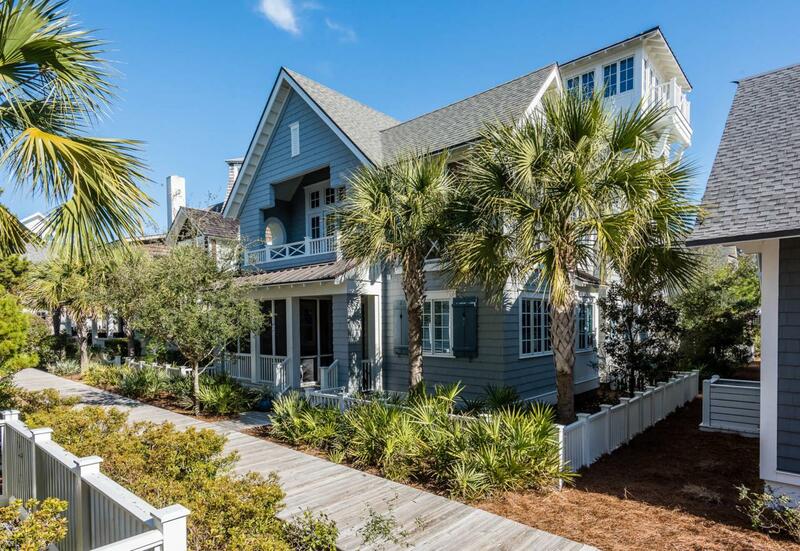 This one of a kind WaterSound beach house is a MUST SEE!